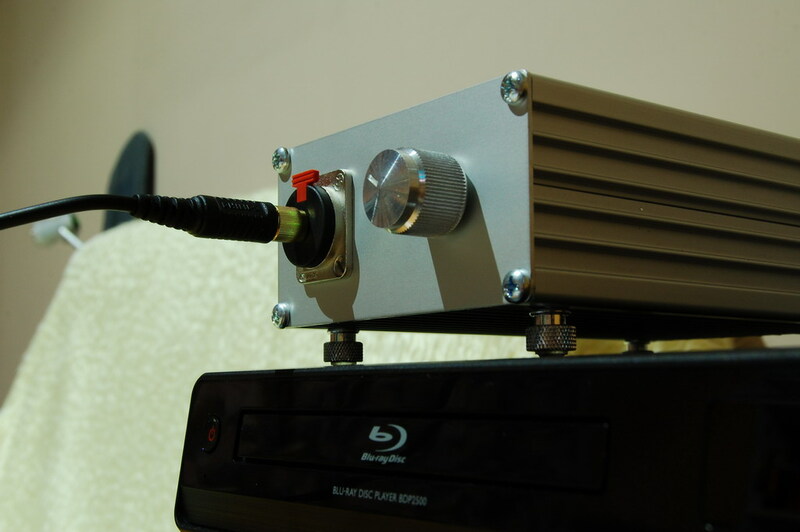 Time has come to finish the project, started long ago, headphone amplifier with TPA6120A. After I finished the assembly of the PCB for the amplifier and performed some tests in August 2009, I just didn’t have an opportunity to finish what I have started. Now everything came in its place and one PCB became a finished product. The final version combines the amplifier together with toroidal transformer, voltage regulator and circuit for delayed output enabling in a nice aluminum enclosure. In the schematic below you can see what exactly is in the box besides the amplifier from the first part of this project. The next module is the output delay circuit. The use of that circuit comes from the fact, that during ramping up of the power supply and amplifier start up for a brief period of time there is large constant voltage at the output. This can damage some headphones. This circuit uses its own regulator, connected in front of the amplifier regulator. The nature of that delay circuit excludes and noise injection back into the power supply of the amplifier. The regulator comprises of a 5.1V zener diode, a 1% resistor to ensure correct voltage even with small load and a filter polypropylene capacitor, 100nF WIMA. The delay is achieved with the help of a 555 timer and RC group RP1, C6. The capacitor C6 is 100uF/25V Panasonic FC series. The variable resistor has value of 22kOhms and it is used instead of fixed resistor with the idea of being able to change the delay period. With those components the delay can vary in the range of 0 to 2.5 seconds. The timer generates one time step signal. It does not oscillate, which means no noise coming from it. The switching component used is a miniature signal relay NEC EA2-5NU with gold plated silver contacts. The power consumption of this relay is very low (140mW maximum) and it allows for switching up to 2A current (not under load if you want to preserve the contact surfaces). The signal connector in the schematics are there just for clarity. They are not included in the actual build. All signal wiring is made of single wires from SSTP CAT7 Ethernet cable, which has very high quality of materials. I used the same wires to make a signal cable to connect to my player, which you can see in one of the photos. Here is the place to throw in a few words about another component, missing from the schematic. It is a 10kOhm logarithmic stereo potentiometer made by Vishay. The resistive material is described as resistive plastic. Unfortunately I didn’t get what I expected from it at this price. At low signal levels there is significant difference between the two channels and slight turn of the knob back and forth this gets corrected. It seems the metal sliders inside are not very well designed. This was the best stereo potentiometer in Farnell’s catalogue, which I could find at a cost of around BGN15 (EUR7.50). Somehow, I didn’t want to spend BGN45-50 (EUR25) on ALPS potentiometer and I couldn’t find good rotary switch to use instead of potentiometer. It seems that lately everyone is using digital volume control and it is difficult to find good quality stereo potentiometers at a reasonable price. Maybe for my next project, which needs a potentiometer, I will accept the price of some good rotary switch or I will try the volume control IC that I have as a sample from Texas Instruments (PGA4311 by Burr Brown). This volume control IC is the best I can find. It is an operational amplifier with programmable amplification ratio, 120dB dynamic range and THD+N of 0.0004% maximum. Maybe it’s not a coincinece that it costs BGN50 (EUR25). I apologize for the low quality photos, but all my camera batteries were empty and I didn’t have much time to play with camera settings and to experiment. Posted on 31.05.2017 01.06.2017 by PenoffPosted in Headphone amplifier with TPA6120A, ProjectsTagged amplifier, audio, headphone, HiEnd, HiFi, music, TPA6120.